The new White House plan will keep 9,800 American troops in the country until the end of 2016 or early 2017. President Barack Obama announced Thursday that he will momentarily halt the withdrawal of U.S. troops from Afghanistan. Under the new plan the current number of troops–9,800–in country will remain unchanged until the end of 2016 or early 2017. After that, the U.S. military presence will drop to 5,500 located in Kabul and military bases in Bagram, Jalalabad, and Kandahar. This is the second time that the White House has delayed a force reduction in Afghanistan this year. The original plan called for 5,500 U.S. troops to remain in country until the end of 2015 leaving a much reduced “embassy-only” presence of 1,100 American servicemen and women in Afghanistan in 2016. The new plan will keep Bagram Air Field to the north of Kabul, Kandahar in the south, and Jalalabad in the east open. The three bases are crucial for close-air support missions, ongoing counter-terrorism operations, and drone strikes operated by the CIA against militants. Today’s announcement has been the result of the deteriorating security situation in the country since the beginning of this year’s fighting season, partially the result of political inertia in Kabul and an uneven performance of the Afghan National Defense and Security Forces (ANDSF):. In October 2015 testimony in front of U.S. Congress, the commander of U.S. Forces in Afghanistan, General John F. Campbell, issued a dire warning should U.S. troop levels and funding be cut prematurely. “At this stage, without adequate international and U.S. funding support and an appropriate Coalition troop presence to oversee the proper expenditure of such funds, the ANDSF could potentially collapse,” he emphasized (See: “Top US General in Afghanistan: Afghan Security Forces ‘Could Potentially Collapse’). In the first 15 weeks of 2015, government casualties increased by 70 percent, compared to the same period last year. Casualties continue to average around 330 a week. 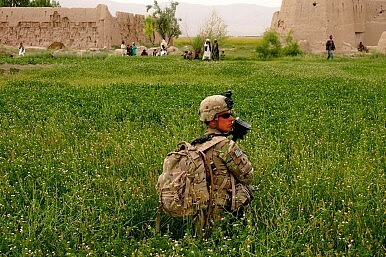 According to a report released by the office of John Sopko, the special inspector general for Afghanistan reconstruction (SIGAR) the United States and NATO have no clear idea how many Afghan soldiers and police are currently engaged in combating Taliban insurgent (see: “Pentagon Declassifies Information on Afghan Security Forces”). “Neither the United States nor its Afghan allies truly know how many Afghan soldiers and police are available for duty or, by extension, the true nature of their operational capabilities,” a SIGAR report released in April stated. The United States has so far spent $60.7 billion to train, equip and pay 195,000 members of the Afghan army and 157,000 members of the police force. However, a couple hundred Taliban fighters were able to overrun Kunduz city within 15 hours in September and hold the city for a couple of days until pushed out by Afghan and NATO special operations forces. A recently published United Nations report also claims that ISIS is recruiting followers in 25 of the Afghanistan’s 34 provinces.